The objective of the RegioStars Awards is to identify good practices in regional development and to highlight original and innovative projects which could be attractive and inspiring to other regions. The REGIOSTARS are Europe’s awards for the most innovative, regional projects. The REGIOSTARS are awarded to projects in five thematic categories (smart, sustainable and inclusive growth, urban development and a topic of the year). High-level academics will assess the submitted project applications and crown the winners. In addition, the public will decide on its own winner through a public on-line vote and award the Public choice award to one of the projects. More details on the award categories is in the Guide for Applicants. The Guide for Applicants provides you with all the necessary information to make your project a winner. Next to the detailed description of this year’s award categories, the eligibility and award criteria, this Guide contains a practical handbook to guide your through the process. The on-line application platform is open from 19 February until 9 May 2019. The winners in the five categories, and the winner of the public choice, will receive their well-deserved price at the festive REGIOSTARS ceremony, to take place in Brussels in October 2019. After being selected by an independent jury, representatives from the finalist projects will be invited to attend the Award Ceremony and receive a certificate and a medal. They will also be included in a brochure, published by the European Commission, as well as in the online database of best practices on the Inforegio website. 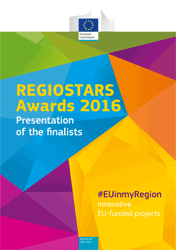 This year's RegioStars award ceremony will take place on Tuesday, October 11, during the 2016 European Week of Regions and Cities. The winners in each category will receive a RegioStars trophy and a certificate presented by European Commissioner for Regional Policy, Corina Creţu, and the President of the RegioStars jury. For each winner a short video is also produced which will be published online followed by a promotional campaign on social media. Applications can be sent by the regional or local Managing Authority, or by the project manager, but with the endorsement of the responsible Managing Authority. If you have any other questions contact us at regiostars2016@iservice-europa.eu. To help you prepare your application, we provide the application form in Word format. However, as of this year, applications can no longer be sent in a Word document, but have to be submitted directly via the online form on the RegioStars platform. The information should preferably be provided in English, but can also be submitted in French or German if necessary. The RegioStars Awards Jury has announced the finalists for the 2016 edition of the RegioStars Awards, the yearly competition honouring Europe's most inspiring and innovating regional projects supported by EU Cohesion Policy Funds. The 23 selected finalists come from regions and cities in 14 Member States: Austria, Belgium, Croatia, Denmark, Germany, Ireland, Italy, Lithuania, The Netherlands, Poland, Portugal, Spain, Sweden and the United Kingdom. The Swedish BRIDGE programme, developed by Sahlgrenska Science Park, provided business support to the Swedish medtech industry to expand its market internationally. The program defined entry points and a “step by step” roadmap on how to explore new markets. Based on a market analysis, Britain was selected as a first suitable export destination for Swedish innovative technologies which could contribute to improving and cutting costs in the health care sector. In combination with a comprehensive and strategic network of newly established partnerships, the project’s approach gave Swedish entrepreneurs a fast track to the market. In total 27 medtech ideas and start-up businesses participated as test pilots and benefited from the program, better understanding the market and country-specific customer needs. The successful programme has strengthened Sahlgrenska Science Park’s position as an important partner for regional development and smart growth and as an attractive business partner for medtech startups with growth potential. The Copenhagen Cleantech Cluster project was launched in 2009 to ensure smart growth, innovation and cooperation among Danish cleantech firms and knowledge institutions. The overall vision of the project was to develop Region Zealand and the Capital Region of Denmark into one of the world’s leading cleantech clusters, creating superior value for the participating cluster companies and the scientific community by creating valuable networks involving a wide range of participants, including knowledge institutions, industry promoters, leading cleantech companies and public authorities. Through a focused effort, the project created 1096 jobs, supported 126 start-ups and facilitated many new cooperations and partnerships. After having merged with another Danish Lean Energy Cluster, the organisation now has over 170 members and holds the GOLD label in Cluster Management Excellence. This cross-border project between Belgium and the Netherlands stimulated technological innovation by promoting sustainable cooperation between companies and research and education institutes. This cooperation resulted in numerous new products and processes that could directly be introduced into the market. The focus was to exchange know-how and cooperate to further develop five so-called emerging `crossroad technologies´ which can be used across different sectors. The CrossRoads project involved 150 companies, and organised 25 cross-border innovation projects, 13 feasibility studies and 40 experiments. It also supported several companies in setting up new and profitable products and even involved education institutes in the experiments and feasibility studies to provide a large group of students with a unique skillset that can be used to further develop the industry. Increasing numbers of difficult-to-treat infections are a worldwide challenge. A fast and reliable diagnosis of infectious agents and their resistance to antibiotics is a prerequisite for appropriate treatment and for avoiding antimicrobial resistance. However, innovations in the field of infection diagnostics still have a hard time finding their way to the market, due to being stuck in the knowledge transfer process between research and business. The InfectoGnostics Research Campus project has laid the foundation for a long-term cross-sector cooperation of a new quality: technologists and scientists from academic institutions, clinicians, and companies teamed up to develop marketable point-of-care diagnostic tests using photonics technologies. The combination of strong and unique competencies in the region enabled interdisciplinary cooperation and the successful development of several new technologies, procedures and materials. It also created synergies between sectors and exploits innovation and market potentials for the regional health economy, which plays an important role in Thuringia’s economy. Specifically targeted to regional clusters and their SMEs, the "Mapping Basilicata project" aimed at revitalizing long-established sectors of the Basilicata region's economy (food, furniture and fashion industries). The key objectives were to strengthen the presence of local SMEs on international markets, innovating production processes and modernising the image of these industrial sectors. The program designed specific instruments and activities in order to stimulate new combinations of existing sectors and technologies, leveraging design and creativity and creating international networks. Over 20 events were organized in 5 countries; 3 registered brands connected to the region were launched; and more than 200 products placed on foreign markets, connecting the SMEs to a consolidated international business network, generating a foreseen turnover of EUR 3 million. The Brussels Greenbizz project is an "eco-friendly business incubator", which aims to support entrepreneurial projects and start-ups in the circular, inclusive and sustainable economy. The project provides young companies with a 8320m² space, complete with fully equipped office spaces, workshop areas, administrative services and personalised support. Installed in a brand new building, completely built according to eco-friendly architecture principles in terms of green building materials, waste water management and energy performance, Brussels Greenbizz is the first business incubator in Brussels solely dedicated to sustainable economy SMEs in the Brussels region. The project is still in its first phase, but results are promising: seven start-up companies have seen the light since the opening of the project in April 2016, creating a dozen jobs so far. In the medium term (3-4 years), it is expected that occupancy levels will rise to 90% and that an additional 200 new jobs will be created. The BioCentre Project (Bio-industries, Biorefineries and Bioproducts) is a technological and innovation campus aiming to help rural regions with low population density to become less dependent on energy and raw materials. The BioCentre campus collaborates with researchers and business to research and invest in innovative new products and technologies based on the model of economic activity within a closed loop – meaning that products can be re-used and recycled, thus reducing the use of energy and raw material. The project, which represents a public/private investment of EUR 9.2 million, has already won 3 excellence awards, has given impulse to the creation of 24 sub-projects in R&D, saw the creation of 4 spin-offs and 6 start-ups and a follow-up investment of EUR 125 million (followed by the European Investment Bank). The project also helped in setting up the All-Portuguese Association of Bioeconomy and Circular Economy, connecting it to society and stakeholders, as well as the creation of 38 projects of scholar entrepreneurship, involving 2360 young people. Marine litter is a huge problem for countries of the Northern Periphery and Arctic (NPA) region. In pursuit of innovative and sustainable solutions for marine plastic waste, the Circular Ocean project seeks to inspire enterprises and entrepreneurs to realise the hidden opportunities of discarded fishing nets and ropes. Circular Ocean promotes the "green economy" by finding solutions to re-use waste, driving eco-innovation, generating efficient and environmentally responsible businesses, and diminishing levels of marine litter. To do this, the project is pilot-testing several new uses for old fishing nets and ropes such as reinforcing concrete or other building materials such as brick tiles and roof insulation. The project is also experimenting with using fishing nets as a material to remove pollutants from water. A major innovation of the project lies in the setting-up of a network of transnational experts which should result in the development of a 'Green Business Suite' targeted at stakeholders who can benefit from this innovative knowledge. Before the start of this project, waste collection in the Lubelskie Region took place mostly as mixed, and waste produced in the municipalities was stored almost exclusively in poorly maintained landfills. Meanwhile, waste from selective collection accounted for only a small percentage of all collected waste. The poor state of waste management infrastructure and lack of modern municipal waste facilities not only caused considerable damage to the environment, the operation of these poorly maintained landfills also saw very high operational costs and represented a health hazard to the local population. The project funded the construction of a new Waste Management Plant, equipped with technology that enables collection of the entire municipal waste stream and separate processing of packaging waste, organic waste, ballast waste, hazardous waste and mineral fraction waste. The plant is also a collection point for bulky waste and used electronic equipment and is equipped to shred segregated green waste for further composting, storage and re-distribution. The aim of this project was the development of techniques to efficiently extract and process the organic waste resulting from wine production and re-use it as raw material or semi-finished product for functional food production, pharmaceuticals, cosmetics and other purposes. Not only did the project strengthen the scientific and research capacity of the Faculty of Food Technology and Biotechnology through the acquisition of new equipment, it also ensured a more efficient knowledge transfer from the scientific and research sector to the small and medium enterprises dealing with wine production and other sectors. This close co-operation made it possible to develop new and ecologically acceptable technologies for the exploitation of the biological potential of organic waste from wine production in order to lessen or even eliminate its impact on the environment. During the project's implementation, project results and developed products were regularly presented through scientific and professional workshops and marketed during various national and international events. The Academy of Social Economy Development Project was implemented by the Regional Centre for Social Policy in Krakow and co-financed by the European Social Fund. The project aimed to bring together individuals from marginalised communities or in a difficult situation and organisations which could help them re-integrating into society (such as NGOs, local government representatives, social and employment service, social economy entities) and create a professional and comprehensive support infrastructure for social economy in the Malopolska Region. Over 1700 individuals benefitted from the project, as well as 245 social economy entities and 203 service entities. In addition, 126 organisations participated in local partnerships, a paper magazine was created and distributed to 1500 persons and 22 study tours were organised as well as 10 social economy events. An increasing number of German and Italian classrooms are made up of students of different nationalities and cultural minorities. Developed as a cross-border project between Tirol in Austria and Alto Adige and Trentino in Italy, the project diversity4kids relies on recreational activities for children and young people (aged 8 to 14) to stimulate intercultural openness and learn about cultural differences in a fun and entertaining way. Through role-playing exercises, improvisational theatre and storytelling, the notion of togetherness and tolerance in diversity is being conveyed in an interactive way. Around 1800 children and 100 teachers participated in 100 events throughout the cross-border area. Special brochures, CDs, and an innovative "play-box" were developed and sent to approximately 300 schools, libraries and other interested organisations. Not only did the project have great results in terms of improvement of school life in classrooms, it also greatly helped in increasing the competence of teachers in dealing with intercultural issues and the promotion of intercultural dialogue and non-discrimination in a school context. The EURegio Barrierefrei project aims to tackle the lack of awareness of the accessibility needs of persons with mental disabilities through initiatives in accessible tourism. The core activity of the project has been the creation of an internet platform promoting holiday accommodation accessible for people with mental disabilities. The website was created when Lebenshilfe Salzburg and CLW (two organisations for disabled persons in Austria and Germany) noticed that there were existing facilities for inclusive holidays within their regions, but that these were rarely known across borders or across regions. Based on peer reviews from visitors, the new website gives reassurance to disabled persons and their relatives that the tested venues and holiday accommodations are truly accessible. After the start-up phase of the project, other organisations for disabled persons were also involved to test and review more venues within their respective regions. In total, 90 tourist facilities have been reviewed and registered and most of the tourist associations of the EU now have linked their websites with the Barrierefrei portal. Vives Emplea is a program that helps unemployed people at risk of social exclusion to improve their social and employment skills through group sessions, personalized sessions and networking opportunities. Participants are assigned to teams of 25 people and count on the support of a coach throughout the 6 months of their participation. The project is developed in six phases of work with different duration and intensity: the selection process of the participants, team building, self-discovery, competences for employment, professional goals definition, action plan and labour intermediation development. The Vives Emplea programme started in April 2014 and has achieved some impressive results: 44 projects were developed in 10 autonomous communities in Spain and 1 325 people participated. Of these, 54% found a job placement and 29% of the participants started studies. Apart from the quantitative results, the program has also helped participants on a personal level, by strengthening their personal, social and work skills. Since the late 19th century L'Abattoir has been an important industrial site located in the centre of the Brussels region. Thanks to the ERDF co-funded project, the site has been transformed into a modern food market, not only aimed at maintaining and strengthening the already existing activities of meat production, but also creating jobs by developing new economic activities linked to the food chain. The recently renovated site, which was designed to meet the most up-to-date food hygiene standards, now hosts some fifty shops, selling mostly food products such as meat, vegetables, fruit, olives, spices, fish and more. These shops, together, account for around 150 jobs. In addition to the food hall, the Abattoir also foresees a pilot project on Urban Agriculture. This project, which should see the light in the course of 2016, foresees the construction of a rooftop vegetable garden covering an area of 2 000m² as well as construction of greenhouses of a similar scale. The Alley of Change is an ERDF supported project enhancing sustainable low carbon transport in the traditionally industrial area of North-Rhine-Westphalia. This project aims at the complete transformation of a former railway track into a 10 km pedestrian and biking trail in the Ruhr Area, a highly densified urban area. The new bicycle highway, which greatly increased the use of bicycle as an eco-friendly way of transport amongst citizens, is equipped with infrastructure, benches and its own information system along the lane. Crossings with roads and streets are properly marked for safety and former train bridges have been refurbished and rebuilt as pedestrian and bike bridges. On top of that, several projects of social inclusion and economic development were initiated around the area, for example reducing early school leaving by 2.6% and creating 2000 new jobs. The Alley of Change is a clear example of the current transformation of the Ruhr region - a former industrial land - into an attractive, competitive and sustainable metropolitan area in the heart of Europe. The Intelligent Transport System Wrocław consists of a wide range of innovative solutions to manage and improve the quality and efficiency of the transport system in Wrocław. In order to reach its objective of more fluid transport and improved road safety, the system uses technology and telecommunications tools such as cameras, sensors at intersections, boards on bus stops and complex communication systems with dedicated software. All the information, from over 2 000 detection devices, is collected, transmitted and stored in the operational hub of the system, which currently employs more than 70 people. The Intelligent Transport System permits simultaneous control at different levels: prioritization of public transport, improvement of vehicular traffic and availability of pedestrian crossings. It also enhances the dynamics of crisis management in city traffic or planned changes with regard to the organisation of mass events or holidays. In 2015, thanks to the Intelligent Transport System, the average tram ride was shortened by 2 minutes compared to the year 2013. In the same year, through increased controls and monitoring, the system has also significantly reduced traffic offences and accidents involving pedestrians. The revitalisation of the Lower Town district, a historical district of the city of Gdansk included investments in infrastructure and social fabric as well as social and cultural activities to tackle the specific problems in this area. All operations were aimed at fighting against social exclusion, with some activities focusing more particularly on children and young people from disadvantaged families, and others directly at their parents. In order to meet their needs, local citizens were involved from an early stage, and a multilevel partnership was created by the City of Gdansk with local organisations such as the Laznia Centre for Contemporary Art, which intensified its cultural work combined with social activities to encourage active participation from the residents. Through the project, 33 facilities underwent revitalisation efforts, and a total area of 22 564m² was renovated. There were 210 social inclusion programmes in which 9463 people participated and 5 new jobs were created at the city's children day care centre. Over the past few years the Belgian city of Charleroi – and especially its city centre – has embarked on a policy of economic redeployment and urban restructuring. This improvement of the living environment went hand in hand with the aim of decreasing the delivery of goods through heavy trucks in the narrow streets of the city centre. In this context, an Urban Distribution Centre of 2 000m² was created outside of the city, where goods can be dropped off by heavy vehicles, before being redistributed by light electric or less polluting vehicles to the stores in the city. As a result of the creation of the Urban Distribution Center, there has been a decrease in the congestion of public road networks as well as a better and safer supply for storekeepers. Moreover, mobility and air quality in the city have been improved. Although the project is still in its starting blocks, it is expected that some 20 jobs will be created by 2020 and the emissions of harmful CO² linked to transport of goods will decrease by 38.2% by the same year. European Social Sound (ESS) was an innovative communication project aimed at communicating about EU policies to a less specialised and younger audience. The project consisted of a 4-part contest for emerging music bands, comprising three qualifying stages and a final concert. The musical performances alternated with lively and interactive informative moments regarding Europe and the European Social Fund programme for Umbria. The information was presented in a dynamic and effective manner, simplified for the occasion, to contextualize and explain the precise opportunities which EU funding represents for its citizens. The information was supported by images, video-testimonials, examples, a quiz and was presented in a storytelling mode, highlighting good practices in EU investment. The events were considered a big success. Not only did they enable the Regional Administration to come into contact with a younger target audience (58% of the 3000 participants were between 15 and 29 years), what was even more important was fact that 89% of the participants liked the initiative and 81% said they understood the institutional issues which were discussed. In Northern Ireland increasing business expenditure in Research and Development (R&D) and encouraging businesses to engage in this type of activity are key objectives for the 2014-2020 programming period. During this period around 1000 research and development projects are expected to receive funding from the EU, making the implementation of a standard unit cost and a more simple and efficient regime a necessity. Until recently the audit burden as experienced by Northern Ireland's R&D firms had a significant disincentive effect on business willingness to participate in ERDF funded R&D activity. The newly developed unit cost will address this problem directly and remove a key barrier to achievement of the Programme objectives, enabling substantial resource savings in terms of Technical Assistance used for verification and audit activity. Resources can instead be used in high-value tasks such as performance monitoring and reporting. The methodology approved by the Programme Audit Authority has now been adopted into national rules by the Member State which means the same base rate will be applied to all new projects and only one rate will be applied throughout the project lifetime and verification. The region of Lombardia hosts over 15% of the total number of Italian businesses and many important research and development institutions. This project consisted of the creation a regional Open Innovation Platform – a collaborative tool favouring and supporting the development of open innovation ecosystems. As of March 2016 (14 months from official launch of the platform), over 3200 users have registered on the platform, the aim being to reach a total of 5000. In addition, an overall number of 222 project ideas were proposed, which received a total of 435 expressions of interest. Almost 50 promotion meetings took place with a heterogeneous public (universities, research institutions, intermediary bodies, business associations, businesses), and several ad hoc meetings with experts were also organised. Improving the public perception of transparency in the use of EU funds was the main goal of the Lithuanian project Jonvabaliai (Fireflies). The project was centred around an interactive website, hosting a map with projects financed by European Structural Funds. Project managers could, on a voluntarily basis, submit information on their project such as results, prices, public procurement procedures, company's shareholders, anti-corruption measures, funds management and more. The more information was made public, the more “transparency fireflies” the project would earn. Since September 2014, more than 630 project managers have joined the initiative following a series of actions which encouraged projects to join. These included an advertising campaign, a contest for municipalities, the possibility to use the initiative’s visual identity, the proposal to join open-project days, the production of road-signs inviting people to visit the projects, as well as a TV-show dedicated to the Fireflies project. The Fireflies website was visited by 35 500 unique visitors accounting for 140 000 page views and as a result of the project, the proportion of citizens who consider the transparency level on allocation of EU funds’ as “transparent” or “rather transparent” increased from 28% to 50. 9%. For longer versions of the projects's videos see the video gallery.